Answer: What are those light patches on the ground? You'd think this is easy.. . But in fact, answering a simple question like "What are those light patches on the ground?" turns out to open up a huge can of worms. I spent waaaay too long on this (but had a lot of fun in the process). 1. What ARE those light patches on the ground? 2. Is there any reason that they would be in a line like this? What's special about this particular are that would cause light patches like this? If you switch to Satellite view (by clicking on the Satellite image in the lower left corner) you can quickly slide the map around until it looks exactly like the map with the patches on it. Of course, with this view in place, you can zoom in and out to figure out what each of these patches is. When I zoomed into the first location (Map #2 with the red balloon), you can see that it's a quarry of some kind. But what KIND of quarry is it? Who owns it? To find this out, I did two things. which led to some great results, including this text by a quarry fan (yes, there are such things!) which lists some quarries in the area--including the name of this quarry... unsurprisingly, Bonny Doon Quarry, which mines limestone. Mine location number: Map No. 728; Mineral commodity: Limestone. 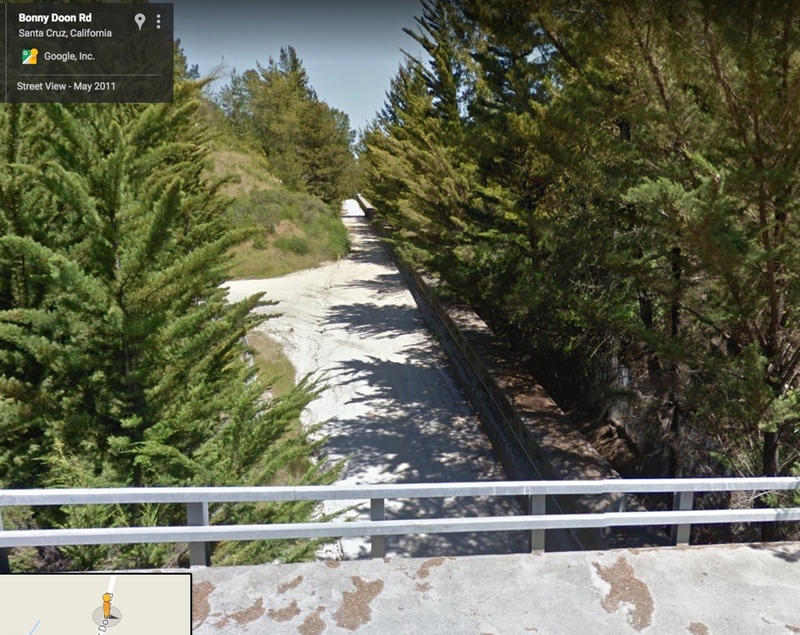 When I put that street address (700 Hwy 1, Davenport), it looks like this place is quite a ways west of the quarry. There's a road there, but more importantly, that's a crushed rock transport line, used to move crushed rock from once place to another. But where does it go? If you zoom out and look at the larger picture, you can see that the transport line goes from the quarry (on Bonny Doon Road) to the cement plant on Highway 1. 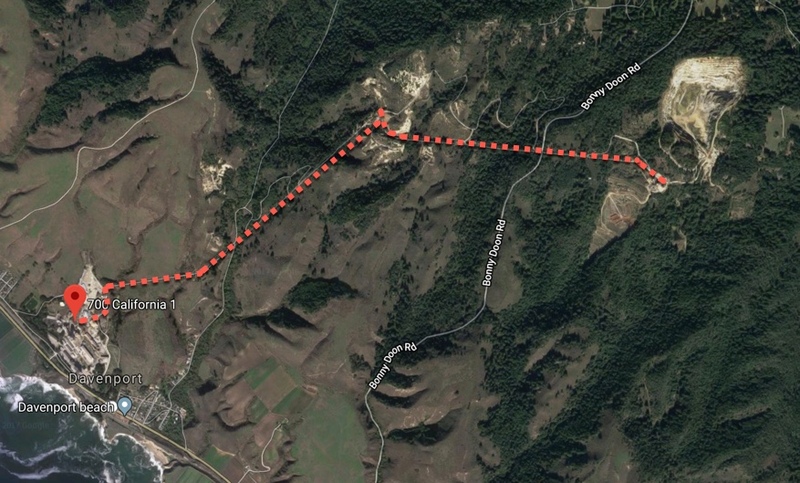 Interestingly enough, it seems to pass through another, smaller quarry on the west side of Bonny Doon Road. 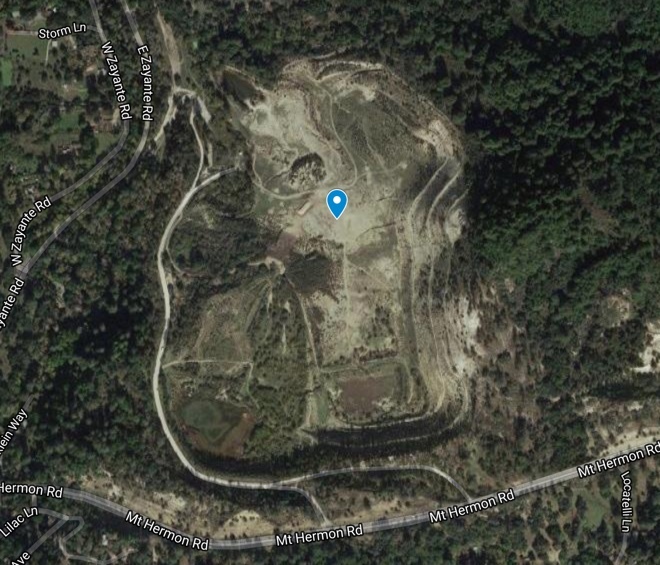 So now we know that this is the Bonny Doon limestone quarry that feeds crushed stone to the Davenport Cement plant, which they then turn into cement. Okay... what about those other "light patches"? Are they also quarries? To figure this out, I downloaded the original image (the one with the red arrows), and then made my own Google Map to organize all of my notes (visit: MyMaps.Google.com to create your own map). Here, I just dropped pins at each of the light patches (and including one extra one that I found near the bottom of the area shown). I made this map to organize all of my notes about the light patches. LINK to the map. 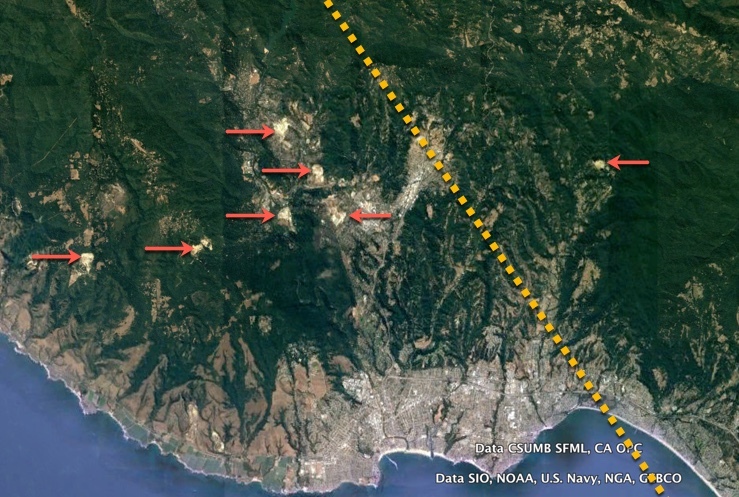 We know that the blue pin on the far left (1) is the Bonny Doon limestone quarry. What about the others? leads to (first result!) 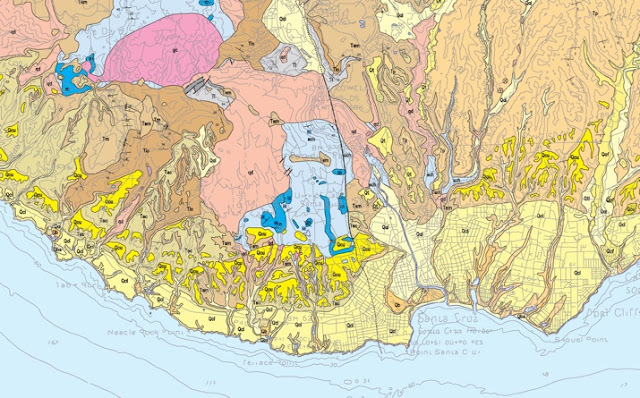 an incredibly handy document, the Santa Cruz County list of quarries! 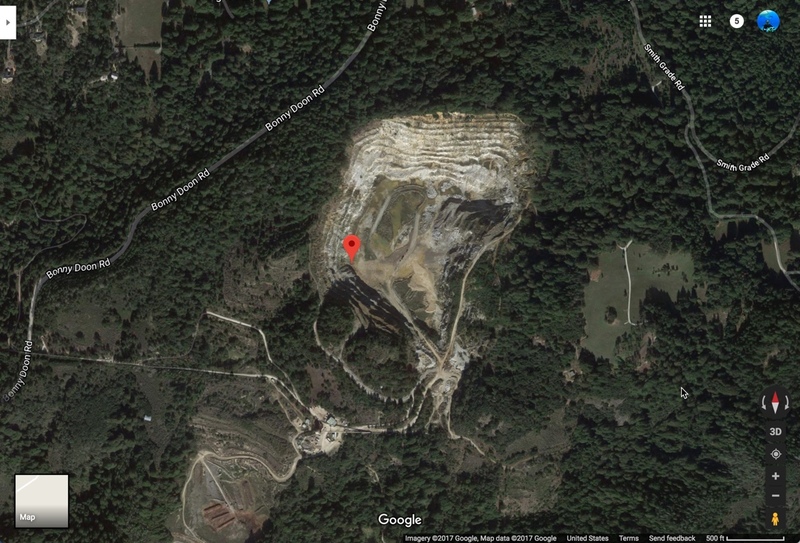 And, to my surprise, the first picture in that document is of the Bonny Doon quarry, with a comment that the..
"Bonny Doon quarry... mined marble and shale for the production of cement at the Davenport Cement Plant... The mine ceased operation in 2009... The mine contains hard rock mining and crushing equipment, maintenance shop, office, rock storage silos, and a belt conveyor that travels approximately 3 miles to the Cement Plant. These facilities have not been removed." 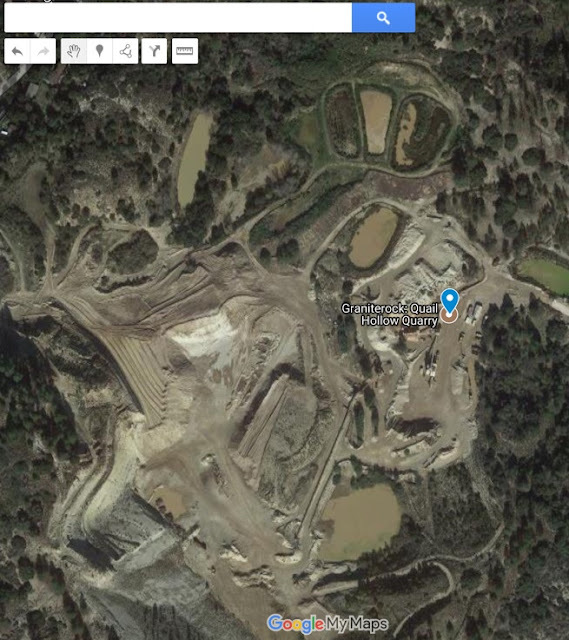 With this great resource it doesn't take long to find that this place in the picture above is the Felton quarry, operated by Granite Construction Company which mines granitic rock for construction aggregate. What about the next light patch (#4, slightly down and to the right)? The only quarry in the list that matches this is the Geyer Quarry (at the foot of Geyer Road, which comes in just from the right hand side of this photo. "...operated by Hanson Aggregates mined sand from the Santa Margarita Sandstone for construction sand. The mined area encompasses approximately 200 acres. The mine ceased operation in 2003. 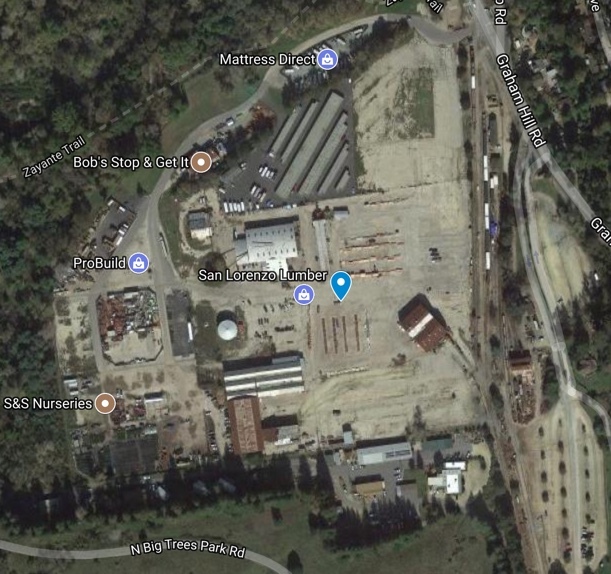 All former mineral processing facilities have been removed and disturbed areas are being reclaimed to open space with a native species vegetative cover on the disturbed lands similar to naturally occurring habitats in the surrounding area. 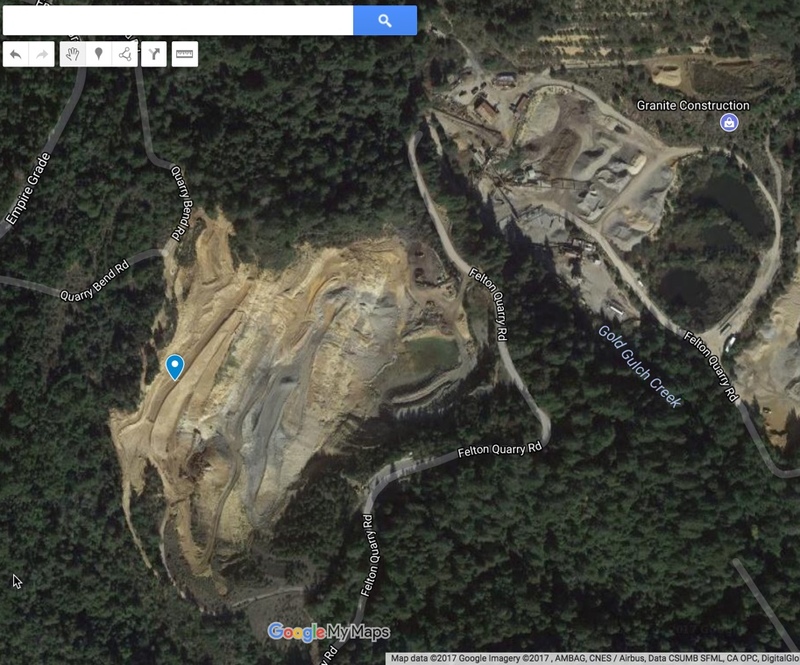 The mine is located within the sensitive Sandhills habitat west of the City of Scotts Valley." ... the marine deposits of the Santa Margarita formation that give rise to the unique sandhills communities also provide sand that is a highly valued commercial product for several reasons. First, the sand deposits extractable from the sandhills are very deep (Section 2.3). Second, unlike cemented sandstones, the Santa Margarita formation is loosely consolidated and thus readily quarried. Third, the action of ocean currents millions of years ago sorted the particles of sand according to their size, rendering the material well sorted for its various uses. The coarse sand is valuable for construction, as it well worn (rounded) and therefore less abrasive to machinery and cause less friction when creating concrete. Unlike beach sand, sandhills sand has a neutral pH that renders it useful for burying utility cables that would otherwise be corroded by the basic pH of high salinity beach sands. These coarse sands are also used in golf courses. So these three sand quarries are all part of the Santa Margarita sandhills formation, which explains why they're all in a line. That's 5 quarries down. Two more light patches to go. 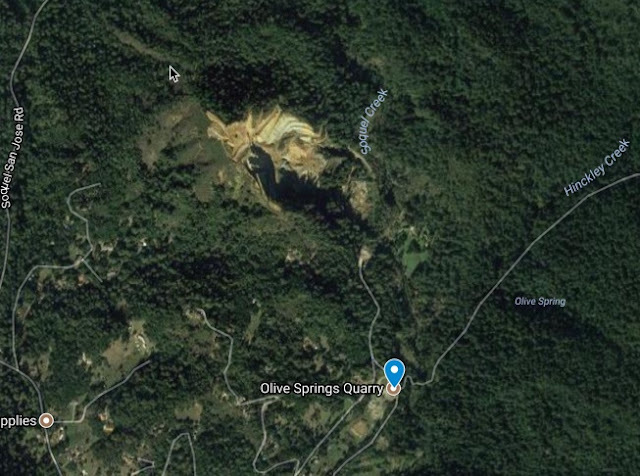 Here, the mine is "operated by Olive Springs Quarry Inc., which mines gneissic granodiorite (granitic rock) for construction aggregate. The mine contains a rock crushing and aggregate processing plant, and an asphaltic concrete (AC) plant. 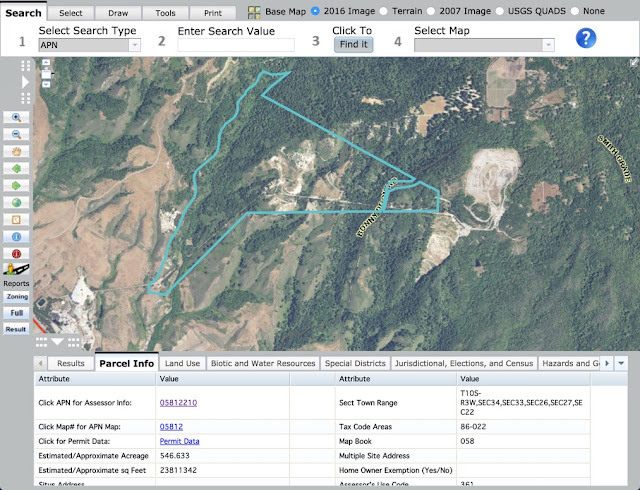 The permitted mining area encompasses approximately 48 acres and is permitted to operate until at least 2044..."
Ah. This isn't a quarry at all, but a lumber yard. But could it have been a quarry in the past? 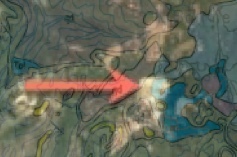 You can click on the 3D button in Maps to take a sideways view of this location. Below I've made a side-by-side illustration of the lumber yard and 2 other quarries. Note how the quarries are all built into the sides of hills with lots of staircasing, while the lumber yard is on the flat part. Quarries can be built on flat land, but in this part of the world, the quarries are typically dug into hillsides. How would we find out if there's a reason for all of these quarries to be located in such an interesting linear layout? 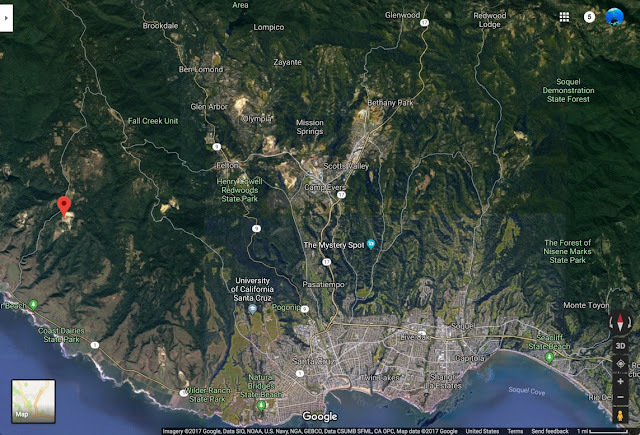 I want to overlay this map with the original image to see if there's any relationship between the geology (e.g., the Santa Margarita sandstone) and the location of the quarries. With a little playing around with the transparency controls, you can figure out that quarries #4, 5, 6 are. Turns out that they are part of the tan colored region which are "middle miocene sedimentary" rocks. What are those "middle miocene sedimentary rocks" at the Quail Hollow (4), Geyer (5), and Hanson (6) quarries? 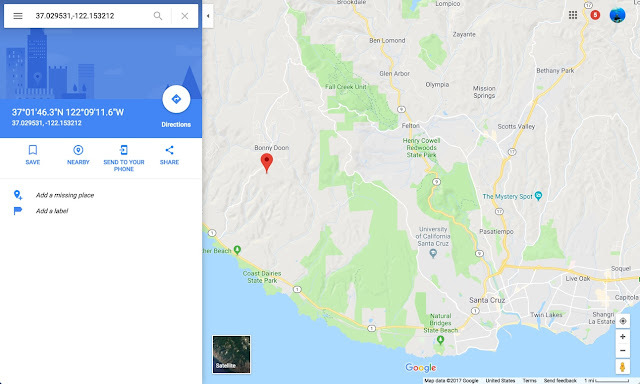 leads to a report on the "Stratigraphy, Paleontology, and Geology of the Central Santa Cruz Mountains, Central California Coast Ranges" (a Geology Survey paper published by the Department of the Interior). In this document we learn that there are several layers of sandstone here, one of which is the Santa Margarita sandstone that's quarried from these locations. The stone is described as "yellowish-gray to white sandstone," which lines up with what we see in the aerial photos. 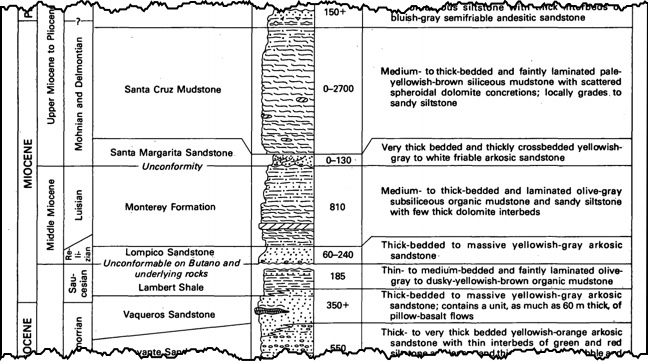 From "Stratigraphy..." page 8, figure 2. 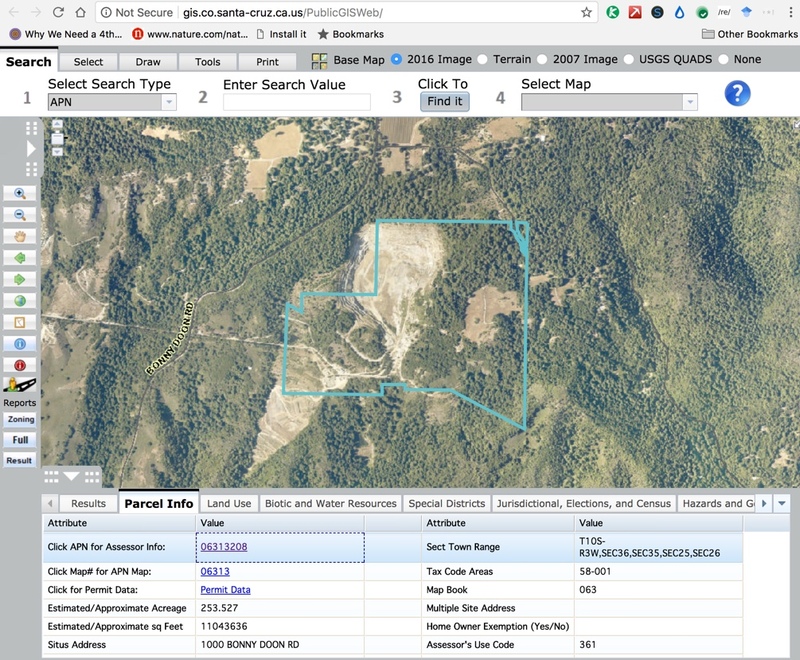 Doing this same analysis for Felton quarry (#2) and Olive Springs (#6) shows us that they're mining granitic rocks, just as the quarry summary tells us. The geology map is the key to understanding what's happening with the "light patches"! FINALLY... we understand what's going on here. There are several quarries that tap into the Santa Margarita sandstone formation (Quail Hollow, Geyer, and Hanson). Since that formation runs roughly vertical, it makes sense that the quarries would run roughly north-south. Both the Felton and Olive Springs quarry are excavating granitic stone, both in small, localized areas of granite. So the "alignment" of Bonny Doon, Felton, and Olive Springs on an east-west axis is just an accident. There's no outcrop of a particular type of rock that causes them all to line up. 1. Use multiple resources to pull together information. As you can see, I used old newspapers, images from satellite photos, and even the 3D structure of the landscape to figure out what's going on. This wasn't a simple "look up the answer" kind of question. It was a simple question prompted by looking out of the plane as I overflew the area. But getting an understanding of why those patches lined up took quite a bit of digging. 2. Pay attention as you read--you'll often find the answers to related questions in related documents. As I was looking for information about the Felton quarry, I found a lot of information about Bonny Doon and all of the quarries that I hadn't yet realized I was looking for! 3. Stay organized. In this Challenge, I was grabbing information from all over the place. I ended up creating a MyMaps map of all the light patches and quarries to keep track of them all. I don't know about you, but this was an all-consuming SRS Challenge. All told, I spent about 8 hours writing up this answer. (And I didn't include all of the interesting side-tracks I went down!) But I hope you picked up a few online research skills along the way. I'm taking the next week off, but will return in the first week of 2018 with a new Challenge! SearchResearch Challenge (12/14/17): What are those light patches on the ground? Flying is a curious thing to do. Not only is it miraculous (humans moving through the air at 10km in an aluminum tube), but it gives one a very different perspective on the land below. When I fly, I'm constantly looking out the window at the land and sea below, usually wondering what it is that I'm seeing. One of the points of this blog is to teach us the fine art of curiosity--in some ways, I write to figure out what triggers a curious question, and then how to find the answer with clever online research methods. In this case, the trigger was seeing so many of these very similar light patches of earth in more-or-less a line. When I see things like this, I get curious. Patterns suggest that something is going on. There's no obvious reason why these patches should be here, nor why they should be in a line like this. Is it just an accident? Or is something else going on here? Let us know how you found your way to the answer! Answer: What kind of horn is that? Is that for real? 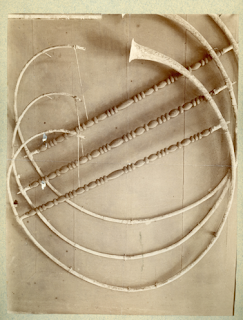 That crazy instrument is a real thing, albeit a bit odd. 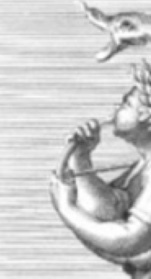 From last week, our Challenge was to figure out if this illustration (from a concert program) was a real instrument, or just someone's fancy. 1. 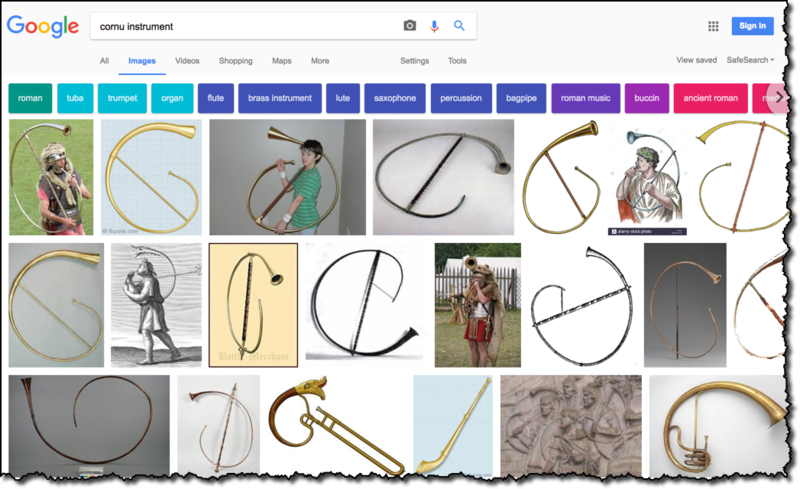 Is this a real instrument? Or is it just a made-up thing? If it's real, what would you call it? 2. Can you find the original source of this illustration? When and where was it first published? Now you can see that the more complete image shows the entire circular horn, with the rest of the body standing in the landscape. If you click on any of these links, you quickly learn that this instrument is the cornu, a trumpet-like bronze instrument shaped in an arc covering somewhat more than half a circle (shaped a bit like an upper-case letter 'G'). It was pretty good size, about 3 m (9.8 ft) long. 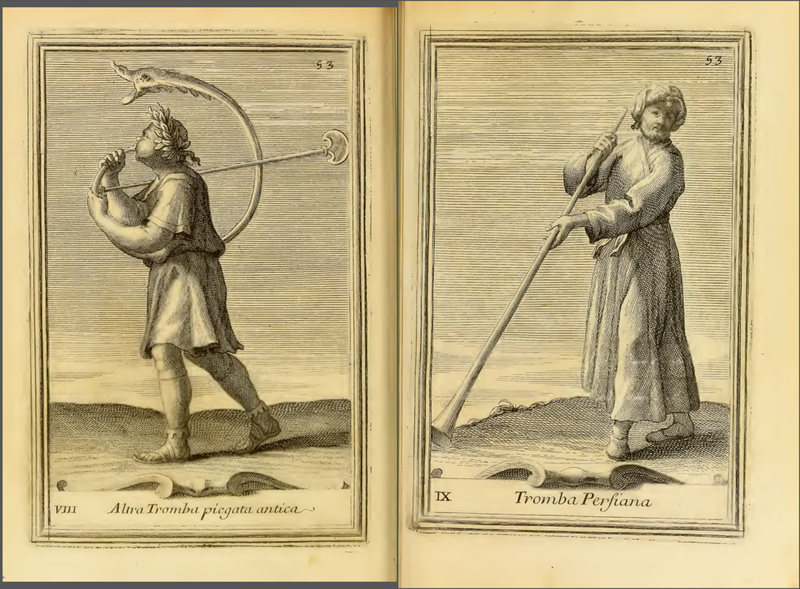 leads us to a number of hits, all of which lead us to the book Gabinetto Armonico (Cabinet of Harmony) in 1723, a splendid collection of 150 engravings of musical instruments from around the world. 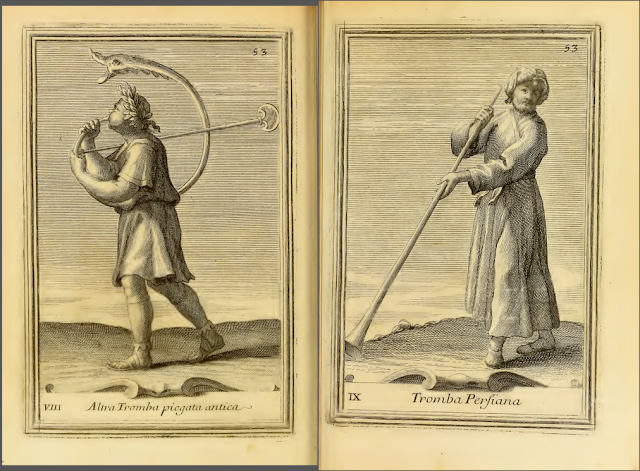 Of course, these are 18th century renderings of ancient instruments, so you shouldn't consider them as accurate depictions of what these things actually looked like, but from the perspective of the 1720s, this is what they thought. 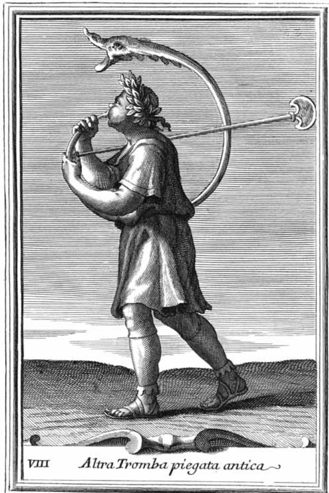 This is the original source of the illustration. 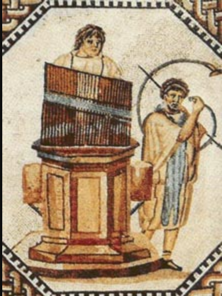 Along the way, I also read that this is referred to as a "zoomorphic" bell. There were zoomorphic instruments, such as the carnyx, but this is a Celtic instrument from about 500 BCE. And it's straight, not curved into a giant G shape. 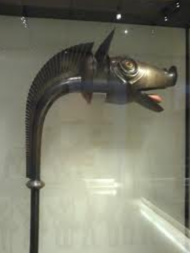 But it's a possible inspiration for the combined dragon/snake head on the 18th century depiction of the cornu! As we've seen before, sometimes clues come from any number of sources. 1. 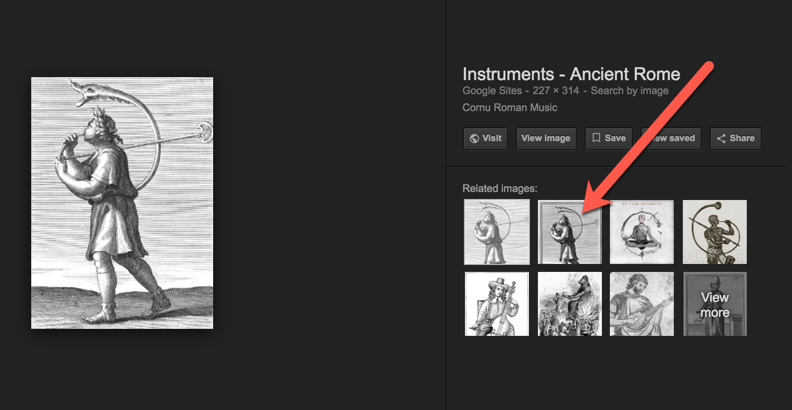 Keep following the image search trail until you find a high-quality image. In this case, we kept looking until we found a "good enough" image that would take us to the source. Moral of the story: Even if you think it might-not-work, try anyway. You might be happily surprised! SearchResearch Challenge (11/29/17): What kind of horn is that thing? Is it for real? ... full of Baroque and Renaissance music, held in a lovely chapel late in the evening--the performers played shawms, traditional bagpipes, recorders, sackbutts, and a stray hurdy-gurdy. As we walked in, the usher handed us a program that was illustrated with this strange and wonderful illustration (this is a scan from the program cover illustration). It's clearly snipped from a larger illustration. But it intrigues me. Is this a real thing? Or just some illustrator's imagination run wild? This isn't all that hard to do, but I had to poke around a bit to find the original. Let us know how you found the source of this somewhat fanciful illustration! Answer: What causes such crazy cone and flower production? This past week we had a harvest-time Challenge. It's Thanksgiving in the US, so our questions about sudden increases in pine cone production (and therefore, the production of pine nuts, which are just about my favorite tree product ever) seems relevant. 1. Does dying (or nearly dying) lead to a sudden efflorescence in plants? 2. If so, what causes this effect? How does the plant "know" this, and respond? 3. 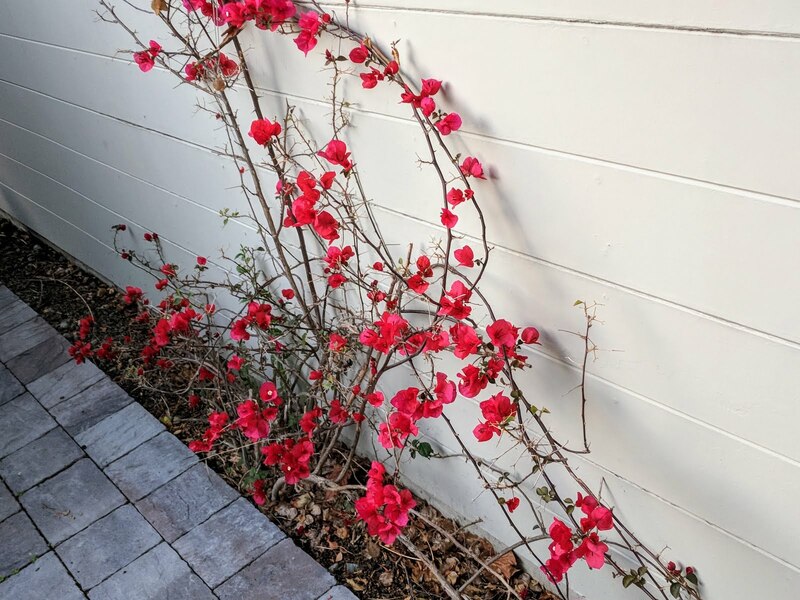 Is this "sudden efflorescence" from a near-death experience true for any other plants? and variations on that query. Mostly, these searches seemed to go nowhere. Sigh. 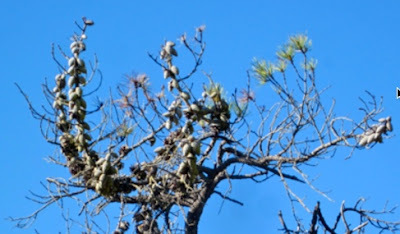 I read a lot about pine trees dying from beetles and drought, but little about the connection with a sudden flowering (that is, an efflorescence) of cones. I learned that pine trees produce varying numbers of cones each year, so there's year-to-year variation. I was beginning to think the idea of "dying pine trees producing large numbers of cones" was a complete myth. But... as I was quickly scanning a fairly low-quality site, I noticed the term "stress crop" used to describe a sudden outburst of pine cones on trees that weren't exactly dying, but were not in good shape. So, I learned a new and productive phrase to describe the sudden burst of pine cones from a pine tree that's stressed by disease or drought. Our second question was "how does the plant know this?" This sounds a bit odd (how does a plant "know" anything? ), but let's try to unpack this idea a bit. What I meant was "how does the plant figure out that it's time to produce a massive crop of cones?" In order to suddenly go from few cones to a "stress crop," something has to happen in the tree to make all of the branches suddenly start producing cones all at the same time. The only way I know of for a tree to do that is to produce some kind of hormone that gets shared between all of the branches, causing a sudden efflorescence of cone production. From one book (Mechanism of Plant Hormone Signalling Under Stress) I learned that "...plants have developed an intricate web of complex machineries to translate perceived stress signal into effective response by modulating the gene expression or directly affecting the physiology of the cell..."
Okay--so plants DO respond to stress by using signaling hormones to make things happen. But what is that hormone for pine trees? As summer progresses, tree energy priorities may also be redirected towards seed/fruit production. An interesting phenomenon for many trees is the “stress crop” effect. Trees that are stressed may divert energy towards a plentiful seed/fruit crop as a “last gasp” before they die as a mechanism to ensure species survival. A heavy seed crop on a scrawny tree may indicate imminent death rather than health and abundant energy. Fruit growers use this effect by pruning trees every late winter in manner that does not weaken overall tree health but that stimulates a “stress” seed (fruit) crop. That's fascinating (and goes partway towards answering our third question). In another fairly technical article Cone Production in Conifers (published by the Pacific Forest Research Centre, part of the Canadian government), we read that there are many factors that determine overall cone production rates. There's the cyclical nature of some species (abundant in some years, and then again some number of years later), but also average annual temperature, moisture, fertilizer, and... stress. In particular, stresses of dehydration, wounds to the outer layers of bark, insect attacks all lead to stress crops. Stress causes a rise in the level of gibberellin, which is associated with intense cone production. This leads me to many more (and increasingly technical) articles on how gibberellin hormone response causes a stress crop response. But this paper also gives us the answer to the "how the tree knows" Challenge. Summarizing here: When a tree is stressed, either by physical damage or by the roots receiving less water than they prefer, the needles, or bark, or roots release one of several hormones (e.g., ethylene or abscisic acid) which then causes the tree to start producing one or more different types of gibberellins, which in turn cause cones to form. If the stress is large enough, a massive crop of cones form. Obviously, if the stress is long and large enough, the tree dies--covered in cones. But if the stress is removed, the tree might well recover and live another year. Bougainvillea flowers heaviest when the plant is water-stressed. Bougainvillea growers often withhold water for extended periods to force the plant into bloom. To stimulate blooming this way, withhold all water until the leaves begin to wilt. Then water thoroughly. For regular maintenance, water only when the soil is dry but before leaves show signs of stress. Mature, established vines rarely require watering. They flourish with calculated neglect. Another article ("Effects of shoot bending on ACC content, ethylene production, growth and flowering of bougainvillea" from the journal Plant Growth Regulation) tells us that stress on a bougainvillea (such as shoot bending, which stress the branch) cause an increase in ethylene production (which we learned above), causing it to flower earlier and productively. and found that stress causes not just pines and bougainvilleas to flower, but also citrus of many kinds, Cyclamen, mangos, and pineapples. Yes! In their paper "Forced flower of pineapple (Ananas comosus cv. Tainon 17) in response to cold stress, ethephon and calcium carbide with or without activated charcoal" (published in Plant Growth Regulation journal), the authors show how spraying field pineapples with either (1) an ice-slush, or (2) calcium carbide (which generates ethylene when mixed with water!) will cause flowering to take place. Bottom line: Many kinds of stress can cause plants to flower--including pine trees, mangos, pineapples, and bougainvillea. 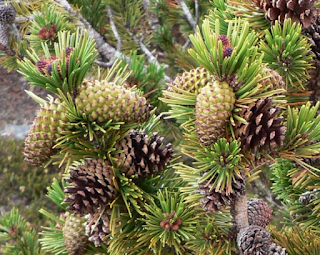 When stressed by drought (which is very common in California over the past few years), pine trees will create a "stress-crop" of cones, easily seen on the branches. 1. You often find answers to other questions while looking around. That's why it's useful to jot down your research questions before you start. That gives you a way to structure your note-taking, and you know what the pay attention to as you research. 2. Pay particular attention to unusual terms or phrases you run across. These are often the key to making exactly the right query. In this example, "stress-crop" lead to all kinds of discoveries, as did finding the term gibberellin, which led us to finding all kinds of articles about plant hormones that drive the flowering (and pine cone) process. 3. Scholar is really useful for technical questions. 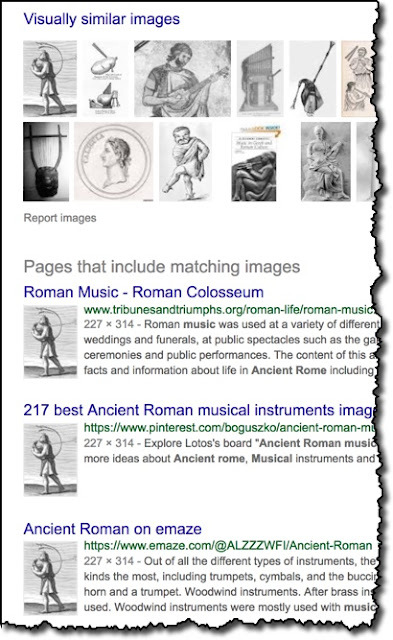 In this case, we used Google Scholar to find very authoritative references in the botanical literature. These were often fairly detailed (and took a lot of looking up of specialty terms), but valuable in the end.